Regular readers of these pages will know that Pluto is the planet of deep and intense personal transformation, or reinvention and the dramatic and sudden ending of one phase of life in order for something completely new to occur. If a person has the Sun in aspect to Pluto at birth, you can pretty much guarantee that their life will contain at least one major event that runs along those lines. John Darwin was one that perhaps took it a bit too far. But Darwin had the Sun conjunct Pluto in Leo so he was bound to make more of a drama about it. Here’s his story. John Darwin and his wife Anne had a business renting bedsits but ran into debts. Darwin’s solution was to fake his own death to claim on his life insurance. He was seen paddling out to sea in his canoe on 21 March 2002, at Seaton Carew, in Hartlepool. Later the same day, he was reported as “missing” after failing to report to work. A large-scale sea search took place, there was no sign of Darwin, but the wreckage of his canoe was found. A death certificate was issued stating that John Darwin “probably encountered difficulties, as a result of which he died”. This allowed his wife to claim on his life insurance. During the years that Darwin was presumed dead, he lived for some time next door to the family home in an adjacent bedsit that his wife owned, for about three years. He entered the home from the bedsit through a secret hole in the wall; the hole was hidden behind a wardrobe with a false back. Darwin obtained a passport using the false name “John Jones”, but using his true home address. The couple flew to Panama on 14 July 2006, where they were photographed by a Panamanian property agent, and the resulting photograph was posted on the web. In May 2007, the couple purchased a £200,000 tropical estate in Panama, with the intention of building a hotel from where canoeing holidays could be run. A police investigation was then started in September when a colleague of Anne Darwin became suspicious upon overhearing a phone conversation between the couple. After a change in Panama’s visa laws Darwin decided to return to the UK and fake amnesia. On 14 June 2007 he emailed Anne to say that in order to obtain the now-required Panamian “investors’s visa” their identities would have to be verified by the UK police. He knew his John Jones alias would not pass such close scrutiny. So he decided to turn John Jones back into John Darwin. He thought he could convince the UK that he had lost his memory and rejoin Anne in Panama with his new passport, police check and driving licence. On 1 December 2007, Darwin walked into West End Central police station in London, claiming to have no memory of the past five years. His wife Anne – who had sold up her properties in England and moved to Panama three months before his re-appearance – expressed surprise, joy and elation at the return of her missing husband. Police had begun inquiries into the financial circumstances of the case three months before Darwin’s reappearance, following the report made by one of Anne Darwin’s colleagues. Mrs. Darwin was known to have claimed on her husband’s life insurance and then emigrated to Panama, so the possibility that she knew him to be alive suggested an irregularity. A newspaper published a photo of John and Anne Darwin taken in Panama in 2006. Anne reportedly confirmed that the photograph was of John, saying “Yes, that’s him. My sons will never forgive me”. The Darwins were then arrested. Darwin’s two sons initially expressed elation at the return of their father but, as the story unfolded, they issued a joint statement stating they felt they had been victims of a scam, and implying that they wished to have no further contact with their parents. In March 2008, Darwin admitted seven charges of obtaining cash by deception and a passport offence. On 23 July 2008, John and Anne Darwin were both convicted of fraud and were sentenced to six years. 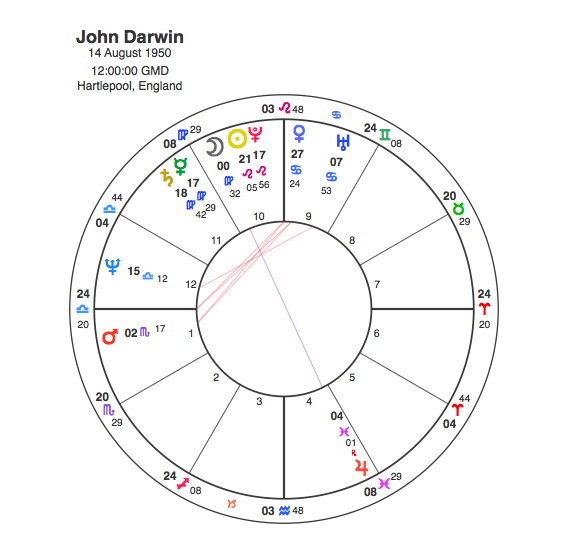 How do we see all this in his chart ? Its unfortunate that we don’t have a birth time as it seems likely that the 8th and 9th houses would be involved for someone who faked his own death and tried to start a new life abroad. But there is enough in the noon chart to point us in the right direction. The most difficult aspect is between the Moon in Virgo and Jupiter in Pisces, an aspect that suggests a carefully planned ( Virgo ) trip abroad ( Jupiter ) in mysterious circumstances ( in Pisces ). Mercury is in Virgo closely conjunct Saturn, another indication of careful planning but also with the suggestion of criminal activity. The Sun / Pluto’s only aspect is a flowing sextile to Neptune. This aspect worked on a number of levels. Darwin was able to use deception ( Neptune 1 ) to further his plans but also his escape ( Neptune 2 ) by sea ( Neptune 3 ). The transits are interesting. When Pluto is in aspect to the Sun, the reinvention referred to would naturally occur under a Pluto transit. In 2002 when Darwin disappeared, Pluto was trine it’s own birth position, sextile Neptune and square the Mercury / Saturn conjunction. This transit triggered the cunning plan. From 2004 – 6 as the Darwins were enjoying the fruits of their scheme, Pluto was trine his Sun and Neptune was trine itself. But his capacity for deception was due to his Sun’s sextile to Neptune. When Neptune transited to oppose his Sun in 2007 – 8, he was arrested and sentenced when Pluto was trine his Moon. John Darwin’s namesake Charles established the doctrine of the ” Survival of the Fittest ” to explain the natural selection process of evolution. By fittest he meant the capacity to fit or adapt to the changing circumstances and demands of life. By cunning use of his Pluto and Neptune, John Darwin attempted to exploit this principle in the most dubious fashion but ultimately the most important evolutionary principle is karma.